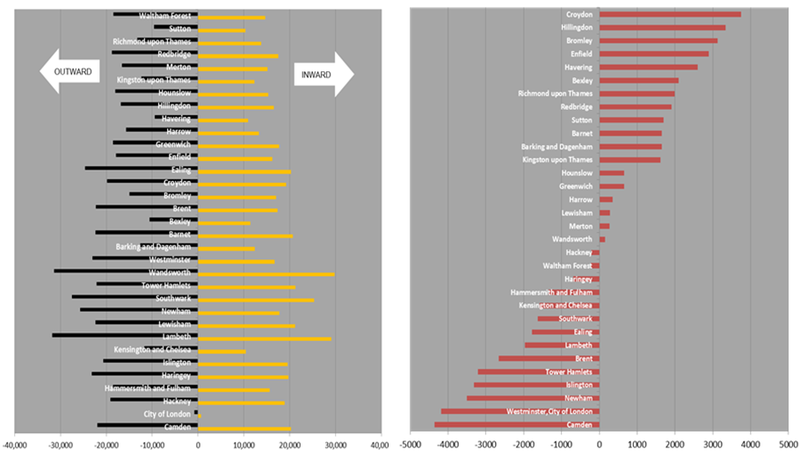 Since 1999 some boroughs have continued to experience the highest levels of net outflow including Brent, Haringey, Waltham Forest and Newham, while Barnet, Bromley, Havering, Richmond upon Thames and Sutton have continued to experience the highest levels of net inflow. Elsewhere net flows were highly erratic throughout the period. 1999-2009 was a decade of substantial churn and flux as demographic pressures placed additional stress on resources and capacity in the capital; at the end of this period net inflow is found in 12 inner and outer boroughs compared to only seven at the beginning of the decade. By 2009 London felt the impacts of recession. 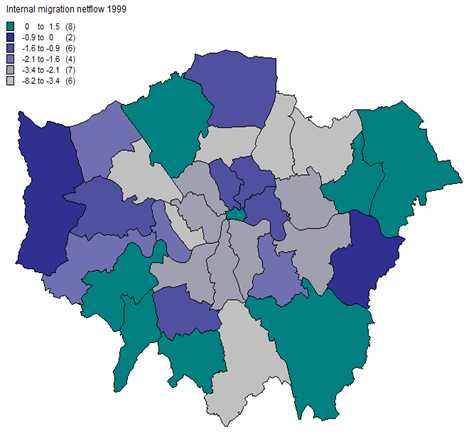 For the last two decades at least, net internal migration to the rest of England and Wales from London has remained negative, with more people continuing to leave London for the rest of England and Wales than arrive. Net international migration on the other hand continues to be positive, with more people migrating internationally to London than moving abroad. 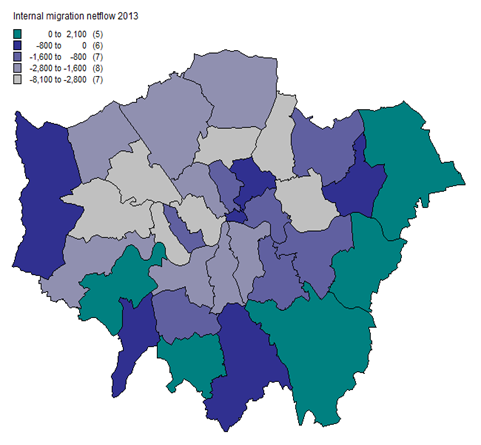 International migration continues to be a driver of London’s population growth. Recession however saw international migration drop and net outward migration slow down. In consequence, by 2013 net inward migration reversed and was found in only five outer boroughs. Although net inflow has concentrated into fewer boroughs, net flow volumes have increased by up to 40 per cent since 1999. Network graphs show an increase in churn and volume between 2002 and 2012; the most significant people flows have always been from inner to outer boroughs however they are now stronger and accompanied by a higher level of flux. Wandsworth, Lambeth, Southwark and Lewisham share a strong inter-dependent mobile population as people move in, along and out. Churn is much harder to conceptualise in spatial terms. Comparing total flows- both inward and outward movement- is helpful to gauge where churn has a bigger impact. In 2013, Wandsworth, Lambeth and Southwark experienced the largest transitory population movements. Kensington and Chelsea, Bexley, Havering and Sutton were among the few who experienced much smaller volumes of total flows. On the whole churn is much less pronounced in outer boroughs. It is clear that churn and net flow affect different boroughs disproportionately and present two different challenges.